Eurica Manning is a registered nurse who began writing professionally in 2007 with the North Carolina Department of Health and Human Services. She specializes in topics related to health and wellness. Manning holds a Master of Science in nurse education. Caffeine is a stimulant and is present in coffee, tea, cocoa, soda, and some medications. It increases alertness, revs up metabolism and enhances mood. Caffeine reaches its peak level in your body within one hour of consumption and can stay at peak levels for up to six hours. 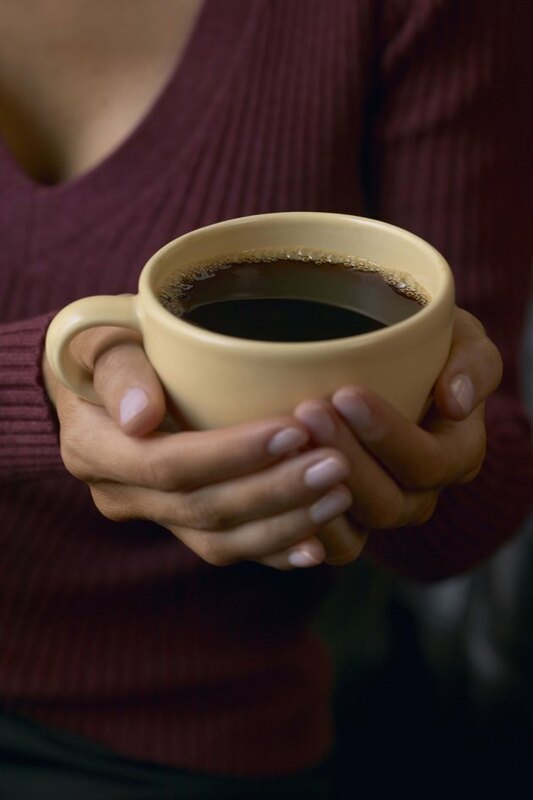 Eighty percent of adults consume coffee everyday according to the U.S. Food and Drug Administration (FDA). Caffeine acts as a laxative and increases peristalsis. Peristalsis is muscle contractions that propel food through the digestive system. The effects can begin very soon after drinking one cup of coffee. For this reason, some people drink coffee in the morning to assist with bowel regulation. Caffeine increases the production of stress hormones. Stress hormones -- cortisol, adrenaline and norepinephrine -- cause your heart to beat faster and give you a boost of energy. Blood supply to the intestines is decreased. As a result, digestion can be slowed. Caffeine is acidic. It increases the acidity and amount of gastric secretions. As a result, irritation of the intestinal lining can occur. This can lead to upset stomach. Excessive amounts of caffeine can cause ulcers and gastritis. Caffeine can worsen symptoms if you have gastrointestinal problems such as irritable bowel syndrome and Crohn's disease. Caffeine acts as a diuretic. Blood flow to the kidneys is increased, resulting in increased urine production. Increased urine can lead to dehydration, which in turn can contribute to constipation. Drinking plenty of water, however, can decrease the risk of dehydration. Moderate caffeine intake in an otherwise healthy person is considered safe. According to the FDA, you can safely consume 100 to 200 mg of caffeine, or one to two cups of coffee per day. You can be addicted if you consume as little as one cup of coffee a day. Withdrawal can be difficult. Symptoms can include headaches, fatigue, decreased alertness, drowsiness, anxiety, feelings of nervousness and difficulty concentrating. Caffeine should be avoided if you have certain health problems including heart disease, hypertension, or disorders of the gastrointestinal system. You should consult your doctor before consuming caffeine.